One of the juicers that I recommend is the Breville Masticating Juicer to get you going on a healthier lifestyle. Are you wondering what a masticating juicer is? There are two main types of juicers, centrifugal juicers and slow (or masticating) juicers. Centrifugal juicers work by shredding the fruits and vegetables and spin at high speed to separate the pulp and juice. Slow or masticating juicers crush and grind the fruits and vegetables to extract the juice, then filter out the pulp. They’re called slow juicers because they don’t spin rapidly, but they still only takes minutes to produce juice! Slow juicers produce drier pulp than centrifugal juicers, and extract more juice from leafy greens like kale. A slow juicer tends to be less frothy. 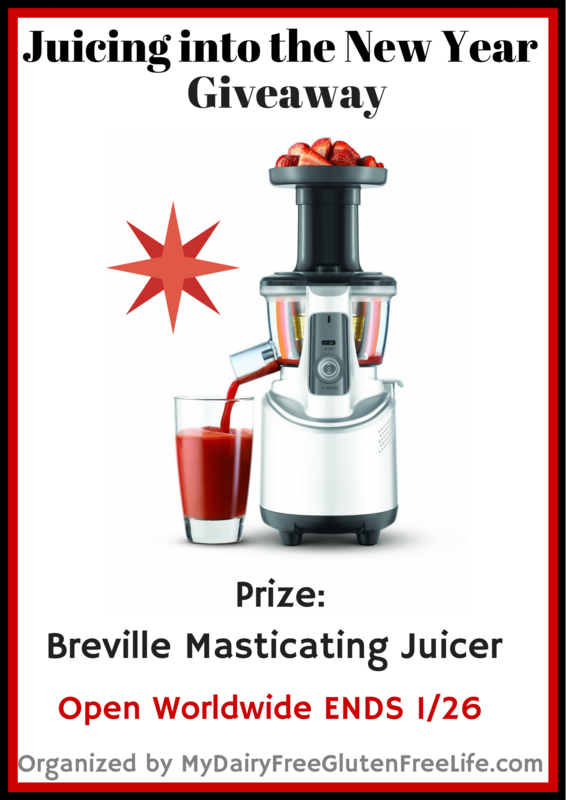 We are giving away one Breville BJS600XL Fountain Crush Masticating Slow Juicer! You can read more about it HERE. My Dairy-Free Gluten-Free Life along with some great blogger friends (like me!) are bringing you this fantastic Juicing into the New Year Giveaway! All the bloggers on the Rafflecopter entry form have pitched in to buy this Breville BJS600XL Fountain Crush Masticating Slow Juicer for one lucky reader to win. We want to help one lucky reader begin their New Year healthier. We all love knowing that one of our readers has the chance to be the winner! This Breville Masticating Juicer retails for $599! This Giveaway ends January 26, 2015 at 11:59 Eastern Time. Disclaimer: This blog and any participating blogs did not receive compensation for the published material in this post. No purchase required to enter this giveaway and there is a limit of one entrant per household. Void where prohibited. Odds of winning are determined by the number of valid entries received. Winner will be chosen by Random.org and will be emailed via the email address used to enter the contest. New winner(s) will be chosen if original winner(s) has not responded within 48 hours of email notification. My Dairy-Free Gluten-Free Life is responsible for prize shipment. This giveaway is not administered, sponsored, endorsed by, or associated with Facebook, Twitter, Google, Pinterest or other social media outlet. Disclaimer is posted in accordance with the Federal Trade Commission 10 CFR, Part 255 Guides Concerning the Use of Endorsements and Testimonials in Advertising. I would love to juice more fruits instead of buying the prepackaged stuff. This is a great way to do it. I also saw that you can make use of the pulp too!